With the arrival of some early fall-like weather, I seem to be emerging from my annual summer heat coma. This past week has been a whirlwind of hooking, crocheting, painting, and animal husbandry. My Down to Earth meditation mat is coming along pretty well. I only have two more petroglyph-inspired chakras to do. Hooking with a wide 8.5 cut of wool strips makes quick work of my hooking sessions. I’m anxious to complete this mat and take it when I go to guided meditation. Lying down while meditating is just about perfect for me. Yesterday a group of Magdalena Rug Hookers spent a beautiful day at Fort Hunter in Harrisburg, PA. Fort Hunter Day is when a variety of groups demonstrate their old-time crafts. We enjoy showing interested folks how to pull loops. It’s mostly the kids, who like to sit a spell and learn how to make a picture with wool, but we even had a man, Al! He loved it. This event also has great music, vendors, food, etc. We always have a wonderful time. I have been hooking toppers for a few small footstools. I’m pleased with the results and I’ll share them with you soon. I’ll see if I can put the finished hooked rugs and these footstools on the Shop page of my website. I am still feeling the urge to purge! 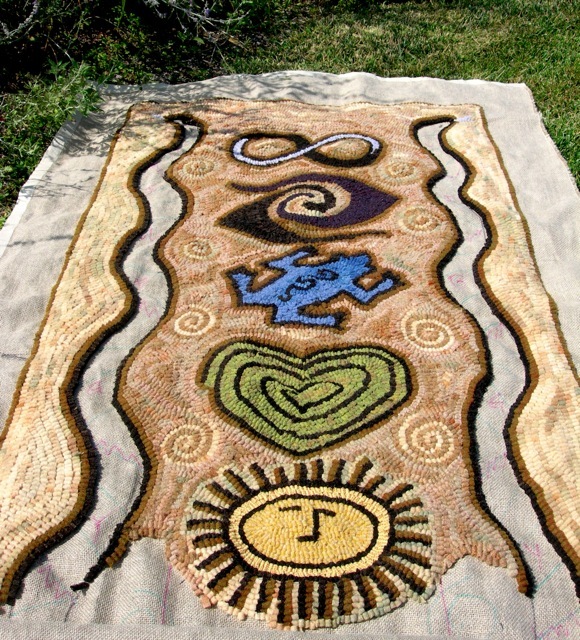 There’s a lot of beauty out there and in sharing rug hooking with the public. P.S. I have added three finished hooked pieces to the Shop page of my website.